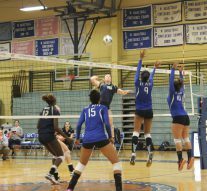 On October 19th, our lady Titans volleyball team played against Hillsborough Community College. St. Petersburg College’s Lady Titans Volleyball Team are ranked 6th in the nation and 3rd in state, so Titan fans had a lot of faith in their team going into this game. According to Bea Viera, who has been playing volleyball for around 9 years now, this game was important to the team as they have lost to Hillsborough before and they want a victory this time. She was confident that they were going to win. Prior to the game, there was an event hosted by the different clubs and organizations at SPC. This pre-game event included a volleyball game open to all students outside the gymnasium, music, and free pizza. During this pre-game event, many students were getting ready to show their support. 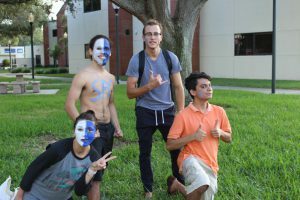 One student could be seen with a face completely covered in white and blue paint, with the letters “SPC” painted onto his chest in light blue. This student was Giacomo Liberato, a student actively involved in several clubs and organizations at St. Petersburg College. Liberato could be seen a group of several other students from different campuses in clubs. Some of these students included the president of Latinos United, Eric Gonzalez-Franco, and the Vice President of the Student Government Association, Gia Good, who could also be seen wearing blue and white facepaint. Upon walking into the gymnasium, students would be prompted to sign in with a club to receive free popcorn and pizza. This was because student clubs and organizations were asked to tell students about the volleyball game. The club or organization that brought in the most students to the game would receive $100 dollars towards their organization. After the national anthem, both teams had warmed up by practicing serves, spikes, sets and receive drills. The ladies were pumped and ready to play for the win. The first six players on the court were players 15, 2, 5, 8, 10, and 14. These ladies dominated the court with their strong team bond. They huddled together in joy for every point earned and always gave each other support when a point was lost. In the first set, the ladies had a pretty rough time, allowing the Hawks to gain a 2 point head at the start of the game. However, the Titans caught up as the ladies gained momentum and got used to the game. The Titans were quickly able to gain a 5 point lead by the time the 1st set ended. In the second set, the ladies switched their setters and changed the whole flow of the game. The ladies’ jumps were full of energy and power; it was clear they had found their rhythm. Whenever one of the teammates dove for the ball, all the other teammates would promptly help her up. The team also started showing admirable teamwork that reflected the very strong team bond these ladies have. The Hawks did win the second set with a score of 25-20, but the Titans were fired up and ready to win. The ladies had a morale boost from the points they had gained after a service ace at the start of the 3rd set. Within half time of the set, the coaches had already used up their time-outs. The intensity of the of the set continued to rise as the scoreboard was blinking 16-21. The crowd started to get tense, hoping the Titans could make a comeback. Although close, the ladies were exhausted and Hillsborough took the third set. The Lady Titans were smart and played hard during this set. They knew that needed to win this set in order to have a shot at winning the game. With newfound confidence and energy, the ladies were giving their best again and made many jaw-dropping saves that ultimately won them the 4th set. Both teams were exhausted at this point of the game. Our ladies were giving it their best with every last bit of energy they could muster. The ladies started the set off with a bang and the audience was cheering energetically with enthusiasm as the ladies were gaining points one by one. At last, the ladies finished off with an amazing play that ultimately won the set and the game. The girls were jumping for joy after winning the game and lined up to shake their opponent’s hands as they retreated back into their locker rooms for refreshers. Even though they had played a long, hard game, the team was still up for taking questions and participating in an interview. Bea Viera, one of the members of the team, explained that most of the players on the team were immigrants and volleyball gave them an opportunity for college that meant a lot to them. She said that the girls were close outside of the court, and they genuinely enjoyed volleyball as a sport.